Research Room: a virtual meeting place for dietetic researchers and those interested in nutrition research. Meet researchers, read about past and ongoing research projects, and more. Click here. 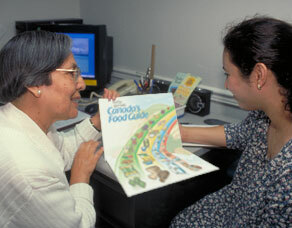 CFDR's research program at Dietitians of Canada's national conferences. Each year, CFDR presents a program of oral and poster presentations. All abstracts presented at the conference are posted to CFDR's website. Special research presentations. A couple of times a year, CFDR hosts celebrations for our contributors and invites CFDR-funded researchers to make presentations on their projects, which are then posted to the website. News releases detailing CFDR's research funding announcements. These are sent to all DC members and media contacts (see Publications). Our newsletter, Keeping in Touch, contains articles on research and CFDR activities of interest to our constituents.